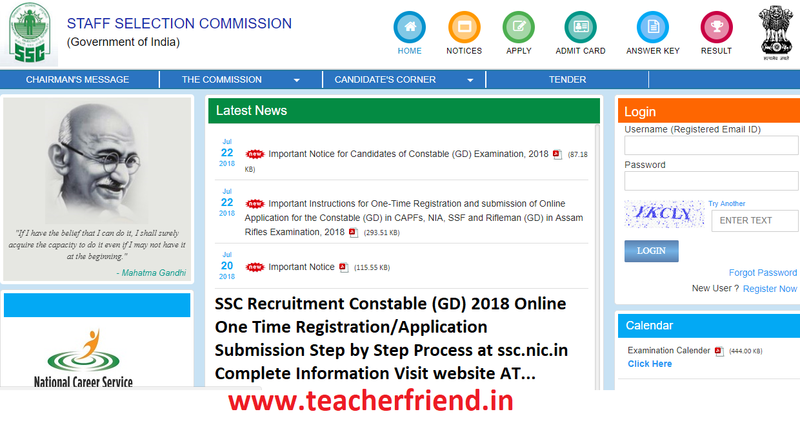 Candidates applying for the Constable (GD) in CAPFs, NIA, SSF and Rifleman (GD) in Assam Rifles Examination, 2018 are required to register afresh. Old Registration ID and Password, if any, will not work on the new website. Please read the instructions given in the Notice of Examination carefully before filling up the online 'Registration Form' and „Application Form‟. Email ID (to be verified through OTP). User ID of the candidate will be his/ her Email ID provided at the time of registration. Scanned colour passport size photograph in JPEG format (20 KB to 50 KB). Applications with blurred photograph will be rejected. Scanned signature in JPEG format (10 to 20 KB). Applications with blurred signature will be rejected. Few critical details (e.g. Aadhaar Number, name, father‟s name, mother‟s name, date of birth etc) are required to be entered twice, in the relevant columns of the Registration Form, for verification purpose and to avoid any mistakes. If there is mismatch between original and verify data column, indication will be given in red text. S No-1, provide information about Aadhaar Number/ Aadhaar Enrollment Number/ Identity Card and its Number. Any one of these Numbers is required to be given. S No-2: Fill your name exactly as given in Matriculation (10th Class) Certificate. In case, you have made any changes in your name after matriculation, please also indicate the same at S No-2c and 2d. S No-3: Fill your father‟s name exactly as given in Matriculation (10th Class) Certificate. S No-4: Fill your mother‟s name exactly as given in Matriculation (10th Class) Certificate. S No-5: Fill your date of birth exactly as given in Matriculation (10th Class) Certificate. Level of Educational Qualification (Highest). Your Mobile Number. This must be a working mobile number as it will be verified through „One Time Password‟ (OTP). It may be noted that any information which the Commission may like to communicate with you, will be sent on this mobile number only. Your mobile number will also be used for retrieval of password, if required. Your Email ID. This must be a working Email ID as it will be verified through OTP. Your Email ID will be your Username for login to the SSC online system. It may also be noted that any information which the Commission may like to communicate with you, will be sent on this Email ID only. Your Email ID will also be used for retrieval of password, if required. m. S No-11: Provide information about your Category. o. S No-13: Provide information about visible Identification Mark. You may be required to show the above Identification Mark at various stages of examination. p. S No-14: Provide information about disabilities, if any. If you are suffering from any specific disability (40% or more) identified suitable for government jobs, then provide Disability Certification Number and upload Disability Certificate. However, PwD candidates are not eligible to apply for this examination. q. Save the information and proceed further to provide Contact Details. r. S No: 15 to 18: Provide information about your Permanent and Present Address. Save the data and proceed further to last Part of the Registration Process. S No: 19 to 22: Upload your recent Photo and Signature as specified at S No-2 above. If you do not have Aadhaar Number or Aadhaar Enrolment Number, then you have to upload the scanned impression of Left Hand Thumb. In case a candidate does not have left hand thumb, impression of right hand thumb or Left great toe or right great toe may be used in that order. Save the information provided. You have the facility to take draft printout and to send the draft information to your registered email ID. Review the information provided thoroughly, before „Final Submit‟. Upon clicking „Final Submit‟ different OTPs will be sent on your mobile number and Email ID. You need to enter the respective OTPs to complete the Registration Process. After submission of Basic Information, if the registration process is not completed within 7 days, your data will be deleted from the system. After completion of registration process, „Basic Details‟ can be changed only once. THEREFORE BE EXTREMELY CAUTIOUS WHILE MAKING ONE TIME REGISTRATION. YOU ARE AGAIN ADVISED THAT NAME, FATHER’S NAME, MOTHER’S NAME, DATE OF BIRTH, MATRICULATION EXAMINATION DETAIL SHOULD BE FILLED EXACTLY AS RECORDED IN MATRICULATION CERTIFICATE. YOUR CANDIDATURE MAY GET CANCELLED IN CASE OF INCORRECT/ WRONG INFORMATION. Login to online system through your registered Email ID and password provided on your mobile number and Email. Change your password, when prompted. Click „Apply‟ link in „GD Constable‟ section under „Latest Notifications‟ tab. Information in columns at S No-1 to 12 will be automatically filled from your One-Time Registration Data which is non-editable. S No-13: Give your preference for Examination Centers. You may choose examination Centers within the same Region. Choice for all the three Centers must be given in the order of preference. S No-14: If you are an ex-serviceman, fill up the required information. Wards of servicemen/ ex-servicemen are not treated as ex-servicemen. S No-15. If you are seeking age relaxation, select appropriate age-relaxation category. S No-16 and 17: Select your Domicile State/ UT and District of Domicile. As the vacancies for the posts of Constables in CAPFs and Rifleman in Assam Rifles is domicile based and vacancies are also reserved for Border Districts and Districts affected by Naxal/ Militancy, therefore you will only be considered from the State/ UT and District mentioned by you at S No-16 and 17 respectively. You will be required to produce Domicile Certificate of the State/ UT and District specified by you at S No-16 and 17 respectively at the time of Document Verification. If there is any mismatch between Domicile State/ UT and District mentioned by you at S No-16 & 17 and the State/ UT and District in the Domicile Certificate produced by you at the time of Document Verification, your candidature will be summarily rejected. S No-18: If you belong to SC/ ST/ OBC category and have migrated from the State/ UT of your origin to a State/ UT where your caste is not recognized as SC/ ST/ OBC, you have the option either to take the benefit of reservation from the State/ UT of your origin or be considered as un-reserved candidate against the vacancies of the State/ UT of your present domicile. Make your considered decision and fill up information in this column accordingly. S No-19 and 20: Information will be filled up automatically based on your Domicile State/ UT and District. S No-21: Give your preference of CAPFs/ Organizations. Filling up of all the 8 options will be mandatory. S No-22: Please see Notice of Examination, Para No: 17 (30) and fill up accordingly. S No-23: Please indicate your highest qualification. S No-24, 25 and information with regard to Photo/ Signature/ Biometric impression will be filled up automatically from the One-Time Registration Data. Preview and verify the information provided by you and Submit the Application. If you are not exempted from fee payment, make the requisite fee payment through online mode or through SBI Challan. In case, fee is paid through Challan, it will get updated within 2-3 days. Take printout of the application for your future reference. You are not required to submit printout of the application or the hard copy of any other document at the application stage to the Commission. Due to above circumstances, the facility for submission of online applications for the said examination has been re- scheduled, and would now be made available on the website of the Commission by 24-07-2018. Accordingly, the last date for submission of the applications has been extended till 24-08-2018 (5 PM). Payment through Challan of SBI can be made at the designated branches of SBI within the Banking hours up to 28-08-2018, provided the challan has been generated before the closing date and time for receipt of applications i.e. 24-08-2018 (5 PM). However, other terms and conditions will remain the same. In the mean time, the instructions for “One-Time Registration” and Online submission of applications for the said examination are being uploaded on the website of the Commission. Candidates may keep the requisite information and documents ready which are to be uploaded during „One- Time Registration‟. The inconvenience caused to candidates is regretted. Get Online Registrastion/Online Application Click Here.